Key levels to watch over the weekend. There are some powerful and key levels to watch going into the weekend. And this should be a weekend to watch because we’re coming up on a week since the whole Tether debacle blew up in Tether’s and Bitfinex’s face. Typically, when an event like that triggers and it’s followed by consolidative price action we see the same behavior again. What I mean is expect an equally powerful move between Friday evening and Monday. I continue to be on the bullish side of things given the constricted price action and time of the year. This guy has been a mover over the past week. Ever since 0x (ZRX) was added to Coinbase, speculation has begun over which of the Coinbase 5 will be added next: ADA, BAT, XLM or ZEC. Rumors have been going around the interwebs that Basic Attention Token will be next – Coinbase affirmed as much in an FAQ saying that the first ERC-20 tokens they were going to add were BAT and ZRX, but they added ZRX first. It only makes sense to speculate that BAT is certainly in the running for being the next added coin. It’s moved almost over 50% since October 10th, but there’s a significant amount of upside potential. The red vertical line represents the 144-day cycle in the Law of Vibration – not surprising to see a big move off of that time cycle. Right ahead is two key price levels: 0.00003721 – 90-degree Square of 9 level and the 50% Fibonacci level at 0.00003840. I am already long on BAT, but I am look for a break above the 90-degree price level and the 50% Fib level. 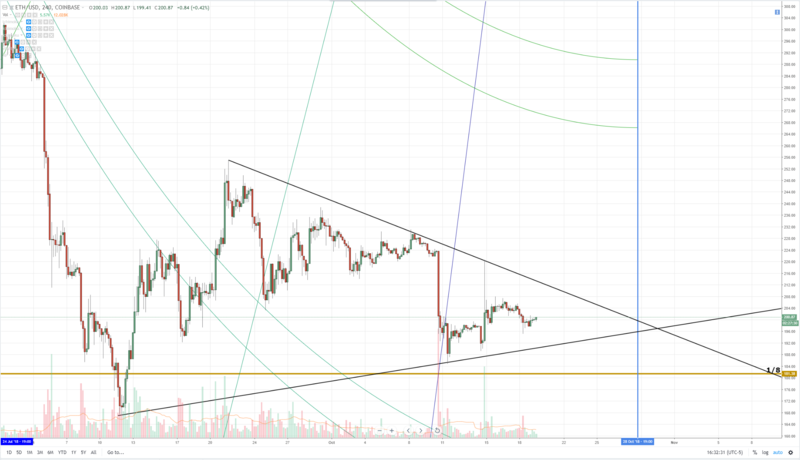 Ethereum is due for a major break higher. It’s stuck in this triangle and ranging after the big move off of Sunday evening/Monday morning. 212 is the value area I want to see for a clear break above this triangle. We could still observe consolidation into the 28th. The highlighted box shows the 50% of Gann’s Law of Vibration time cycle. Strong continuation moves higher here. I want to see XLM above the 0.29 level – which could happen really fast or take… forever. 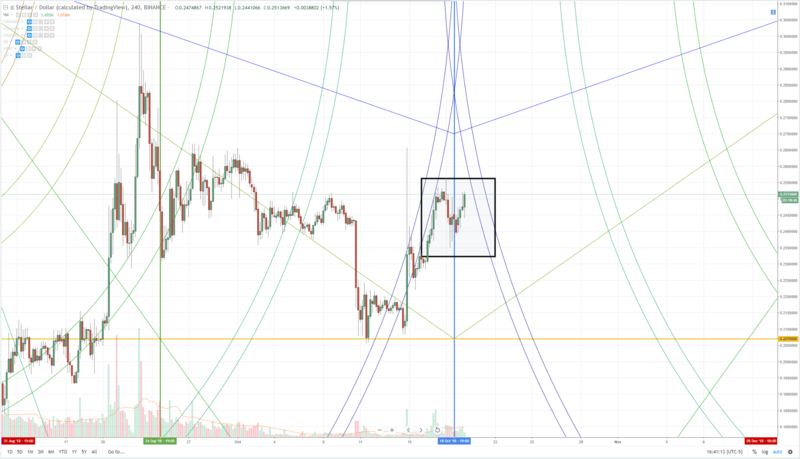 It’s got a ton of momentum behind it though, a breakout higher is definitely in the cards – I anticipate a breakout higher this weekend, beyond the 0.26 level. NANO keeps testing a key downtrend angle – it’s a long term downtrend angle but it’s currently above it. The short term angle is very steep and could easily be breached. 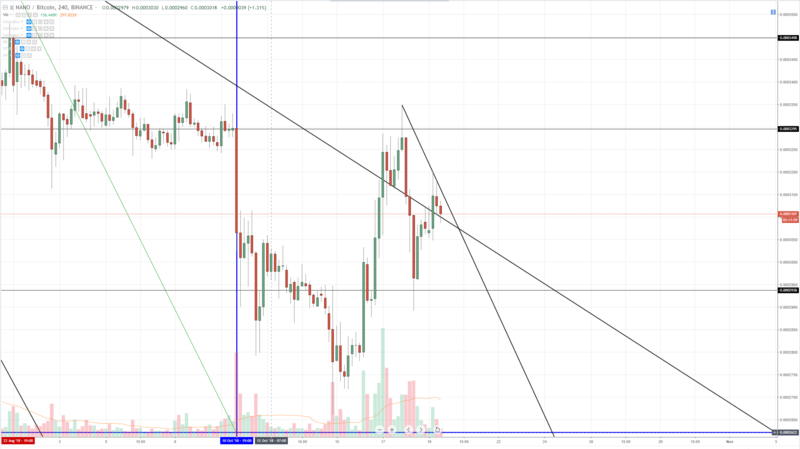 I am looking for a break above it at 0.000321. 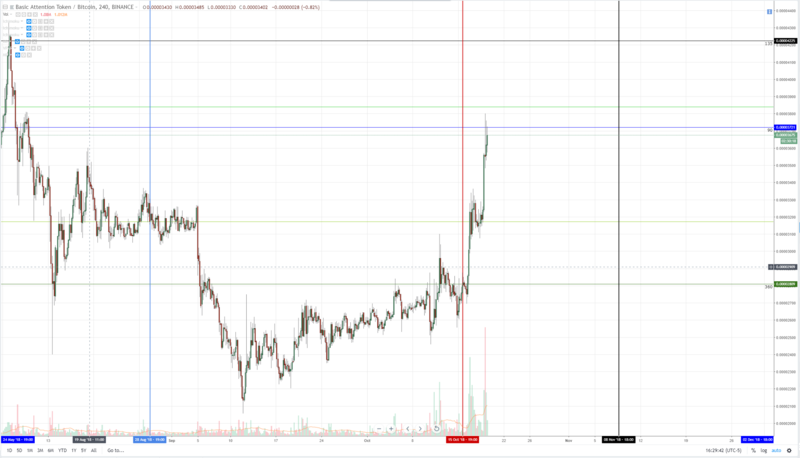 Ultimately, I want to see a move above the most recent swing high at 0.000335.